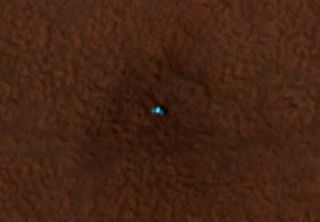 The butterfly-like object in this picture is NASA's Phoenix Mars Lander, as seen from above by NASA's Mars Reconnaissance Orbiter. PASADENA,Calif. — A spacecraft orbiting Mars has photographed the Phoenix Mars Lander onthe surface of the red planet, NASA scientists announced today. Missioncontrollers also said the mission seems to have hit its first snag as the radioon NASA?s Mars Reconnaissance Orbiter (MRO), which communicates with Phoenix,has shut itself off due to an unknown problem. Despite this setback, Phoenixseems to be doing just fine. ?Phoenix ishealthy, everything is fine,? said Fuk Li, manager of the Mars ExplorationLaboratory at NASA?s Jet Propulsion Laboratory (JPL). The radioshutdown prevented mission scientists from sending Phoenix its instructions forthe day this morning, as well as from receiving another set of images from thelander. MRO controllers are working on the problem now, and hope to have itfixed for the next scheduled link-up this evening. If theradio fix goes well, mission scientists will start attempting to move thelander?s robotic arm tomorrow. A few days later, they will likely startpracticing scooping up soil and in about a week, they may start deliveringtheir first samples to the lander?s instruments. Phoenixlanded in the north polar regions of Mars in the Vastitas Borealis plainson Sunday evening. The $420-million mission, which launched in August, plans todig down to the rock-hard layers of water ice thought to lie under the Martiansoil near the planet?s north pole. It will test the soil and ice for signs thatthe water was once liquid to see if it could have created a habitable zone formicrobial life at some point in the past. The colorimage the MRO?s HiRISE camera took on Monday showedPhoenix, with its fan-like solar arrays visible. The image also showed twoblack spots that appear to be the jettisoned heat shield and a bounce mark itmay have made, as well as the lander?s parachute, which appeared as a whitesmudge about 300 meters away from the lander. ?We?rethrilled with these images,? said HiRISE principal investigator Alfred McEwenof the University of Arizona. HiRISE will likely take more images of the landerand the surrounding terrain throughout the mission. Phoenix wasable to send back more images last night, including one of its robotic arm,which showed that the biobarrier that protected it during its flight had morefully deployed since the previous day. The lander also took more images of thelanding site terrain, this time to the south of Phoenix. They showed a seriesof low hills about 5.5 miles (9 kilometers) away, which indicate clear skies onMars. ?That meansthat there?s not much dust in the atmosphere; it?s a very clear day,? saidPhoenix principal investigator Peter Smith, also of the University of Arizona. Scientistshave also been able to more accurately pinpoint Phoenix?s landing spot. The newestimate of the lander?s position shows that ?we really landed in the spot thescientists were looking for,? said JPL Navigation Team Chief Brain Portock. The landingspot still looks largely devoid of rocks, which is perfect for digging, Smithsaid. ?All of this is prime digging area,? he said. The MROradio glitch has delayed Phoenix?s schedule by a day, mission scientists said,but they noted that Phoenix has a default set of instructions it follows whenit doesn?t receive any new commands in the morning. If MROcontrollers are unable to fix the radio problem this evening, commands will besent to Phoenix tomorrow morning via the Mars Odyssey orbiter, missioncontrollers said. NASA'snext Phoenix mission briefing will be broadcast live on NASA TV at 2:00 p.m.EDT (1900 GMT) on Wednesday, May 28. Clickhere for SPACE.com'sPhoenix mission coverage and a linkto NASA TV.